However, there is still room for improvement for the service. We were there for brunch on a weekend, and they could not handle the crowd. Having said that, I do think they have good breakfast food and the cafe has a nice laid-back feel which sets the tone for a lazy afternoon. 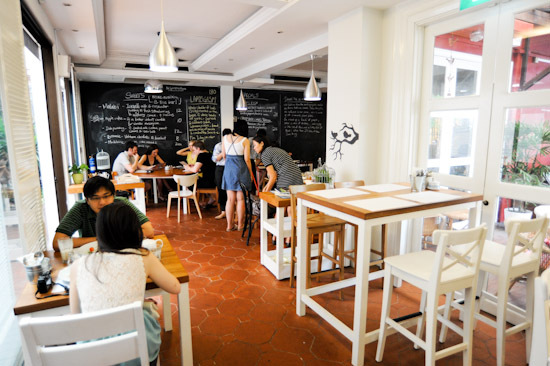 Artichoke Restaurant is all about communal dining. Most of the family-style shared plates for dinner are around $10-$15 for appetisers and $25-$30 for main courses. As for Weekend Brunch, they have nine items on the menu. Prices range from $9 for the Turkish Toast with homemade apple, to $14 for the Scrambled Eggs and $18 for the 65 degree slow cooked eggs with smoked salmon. If you are feeling hungry, go for the Self Destruction ($24) – which is sort of like a big breakfast with everything. 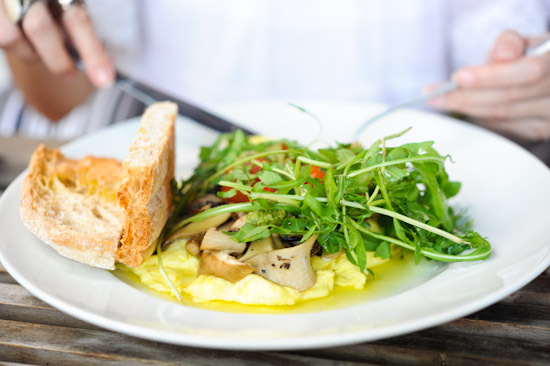 Accompanied by roasted tomatoes, toast and rocket, the Scrambled Eggs comes with either organic mushrooms ($14) or Maple Glazed Bacon Chop ($16). We ordered both, and the Maple Glazed Bacon Chop was certainly more value-for-money filling since it came with a huge slab of Bacon Chop. At $20, I felt that the Middle Eastern ‘baked beans’ with Merquez lamb sausage (above picture) was somewhat overpriced. There was nothing particularly outstanding as the dish only had lamb sausage, baked beans fried eggs and toast. 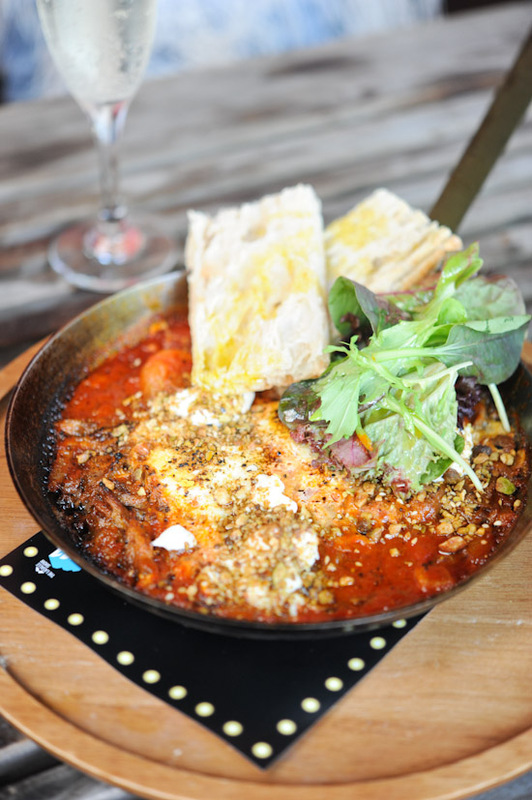 I’d definitely go for the Eggs Shakshouka ($20) which you see in the first picture of this post. 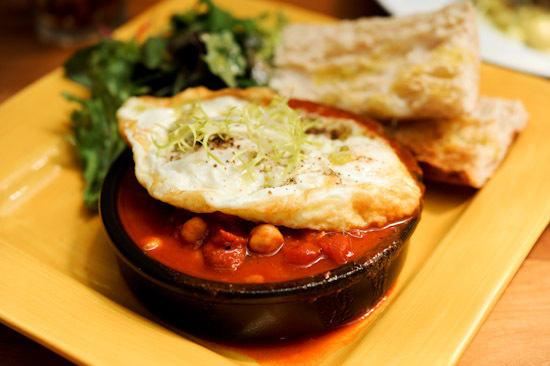 It reminded me of the Tunisian Breakfast that I had at Wild Honey. Two eggs baked in tomato sauce with braised lamb, yogurt cheese and toast. The braised lamb was delicious. I didn’t have the Grilled Haloumi cheese on toast ($17) with mushrooms, avocado hummus and wild rocket, but it looked quite appealing. My favourite breakfast dish at Artichoke Restaurant was the Self Destruction ($24) – which came with crispy hash brown, country sausage gravy, melted cheddar, mushrooms and two fried eggs. The portion was huge, and it was very rich (perhaps a little too salty). Make sure you share this with someone, it is impossible to finish it on your own. 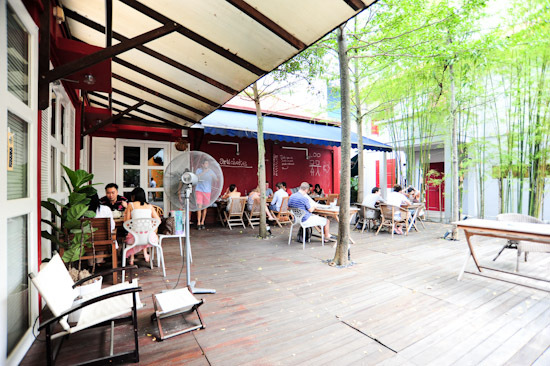 The al fresco area at Artichoke Cafe is a good place to chill out if you can take the heat. Otherwise, there are plenty of tables indoor, and they also have a Greenhouse which is like a private dining room. Still looking for a brunch place? Why not visit Artichoke Cafe & Bar this weekend? i had the Eggs Shakshouka but in my opinion it’s kinda overpriced cause i couldn’t find much lamb in it. but yeah, awesome ambience! This looks like a great place to catch up with friends during the weekend. You make their food look so yummy! 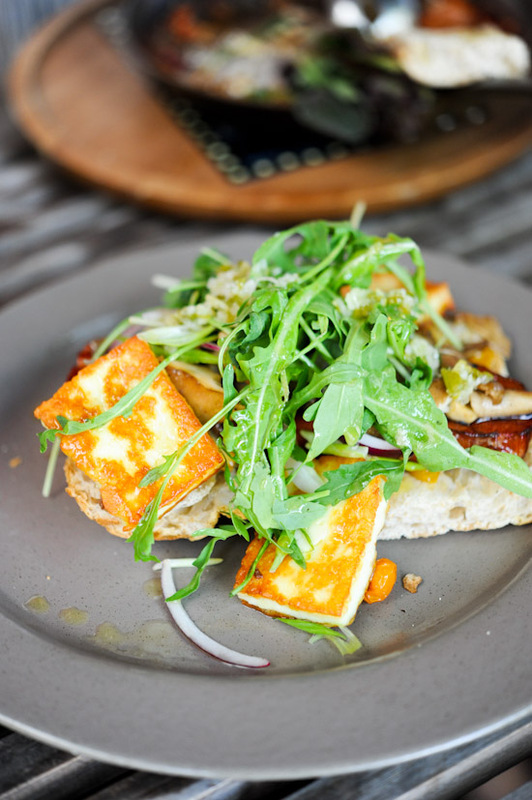 I’m not sure about the grilled haloumi cheese here, but from my experience, grilled haloumi cheese is a beautiful thing – it’s mellow and mildly tangy. Sometimes, I’d use it during barbecues too. Unlike other cheese, it doesn’t melt even when you grill it. Oh, thanks for the Don Quijote recommendation the other time. I went there on Mother’s Day, and my parents totally adored that place. mr lau, now im very hungry for artichoke all over again! Do u noe if they serve brunch during weekdays and public holidays? pam: nope, brunch is only available during weekends. This place is dangerously close to my office but I never knew it until I read about it here. Went there for the brunch and had the scrambled eggs and maple glazed bacon. First bite and I was in heaven! I spent a lovely brunch time today at Artichoke!